Home Local News WATCH! PAGCOR CHIEF, ANDREA DOMINGO DINEPENSAHAN SI DUTERTE AT HINIKAYAT ANG MGA FOREIGN INVESTORS NA HUWAG MANIWALA KAY LENI! WATCH! PAGCOR CHIEF, ANDREA DOMINGO DINEPENSAHAN SI DUTERTE AT HINIKAYAT ANG MGA FOREIGN INVESTORS NA HUWAG MANIWALA KAY LENI! 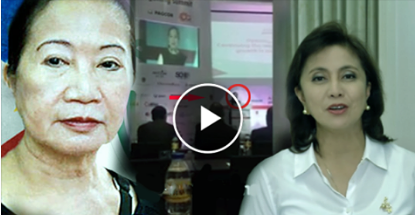 These are fiery words from PAGCOR Chairperson Andrea Domingo, speaking in front of foreign investors in the 1st ASEAN Gaming Summit. "During your stay here... [in] the Philippines, did you see any dead bodies lying around? Did you see any policemen, with guns out, chasing after suspects, trying to kill them?Have you read... reports of people being tortured, being arrested without warrants? Have you seen women and children being separated from men and the men being taken without any (search) warrants? ...I really view her as a female creature who wants to be president so bad and so fast,she'll do anything. Go there under any manner or circumstance except go through the legal electoral process that President Rody Duterte went through." Sponsor So what can you say about this one? Let us know your thoughts in the comment section below, and don't forget to share this post to your family and friends online. And also, visit our website more often for more updates. Disclaimer: Contributed articles does not reflect the view of NEWSMEDIAPH. This website cannot guarantee the legitimacy of some of the information contributed to us. You may do additional research if you find some information doubtful. No part of this article maybe reproduced without permission from this website.